Here is Austin looking a bit geekie in the beginning headgear. He made each "horn" out of clay. As you can see (I hope) some of the horns had to be Duct-Taped to Austin before the rest of the suit was created. Austin getting into the "netting" that helped him achieve that "scaley" look. Austin kindly sent me some instructions and helpful tips on the making of this superb costume. After Nov.15th you will find these instructions in my "Homemade Costumes" pages. Austin is not only a great Costume designer, his daily JOB is as one of our many sons who are in the Armed Forces. Austin THANKS for your entry. I know I'm not the only one here who appreciates your service to our country.. So MANY "Thank Yous" for that also. 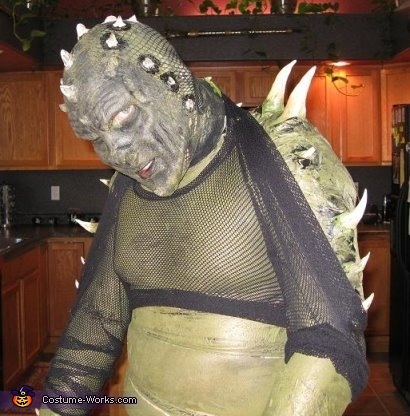 This homemade costume for men entered our 2008 Halloween Costume Contest, and won 1st place!